BID Leicester is looking to support start-ups and fledgling businesses with innovative new products or services. Criteria We're looking to support new businesses, typically between 0-2 years, this can be a brand-new business or an existing business with an innovative idea, or new product or service. Applicants should demonstrate the need for their idea; what is the market for it? Why is it different or unique to what is already available? Importantly, what difference will it make to people in Leicester? We would like to see applications that demonstrate positive economic, environment and /or social impact. Businesses applying can be for profit or not for profit. Funding will be secured by the best projects that show promise to positively impact the city centre community. This will give start-ups a better chance of surviving, thriving and realising their potential. Leicester City Centre, defined as the area within the inner ring road. This project is enabled for overfunding. If the project hits its funding goal before the end of the campaign period, any extra funds raised will be spent (in order of priority) on: We'll use extra funds to support more projects that show demonstrable benefit to local business start-ups in the city centre. 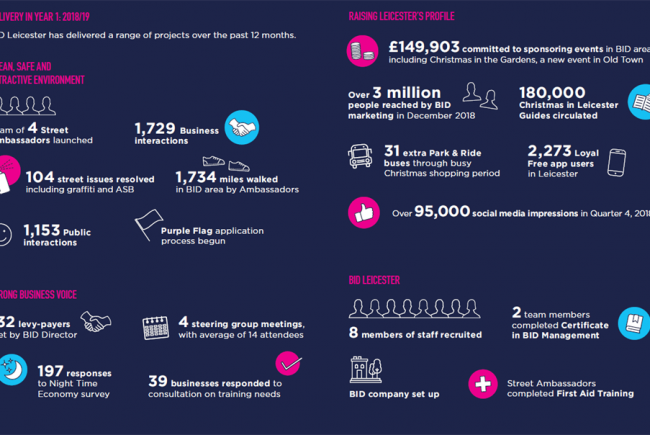 We are the Business Improvement District for Leicester city centre (BID Leicester).